The severance pay or packages are the group of benefits provided to the employees who are terminated or laid off after a period of time. The benefits given to them may include the additional salary, health insurance schemes, or many other incentives. The following mentioned are few tips on negotiating severance package. It is very important to remain professional even if you are not informed about your termination. Even if you are informed about the termination before weeks, months or the day before when you are being terminated, be professional. If you will remain professional, you will be able to know your employer in the near future like if you get a chance to go through the formal exit interview then you can politely raise the voice for your grievances. If you remain unprofessional, you may leave bad impression at your company’s staff, the lower level employees, co-workers, disqualifying for the future opportunities. Even if you have been given lots of notices regarding your termination, this becomes one of the great chance to know the flaws that you have and also the reason to find out the justification for you being terminated. Get those reasons for yourself and start working on what you find less than other employees still working there. Every severance pay is different in itself. Some of the employer pays their employees a whole lump sum amount at the time of his termination but many of them pay the employees in few payments, so it’s your duty to find out if the severance pay that you receive contains the paid leaves, the holidays, sick leaves or any other paid vacation if any. Severance check is important before you leave the organization so that no rights are left. When you are given the termination, make sure you check into the severance package if any insurance benefits are given or no. You may have to get insurance benefits like of group life insurance, health insurance, and dental insurance if any. These items may not be included into the standard severance package but there is nothing wrong in asking. Also after knowing the inclusion of any insurance benefits and all, refer to other details also like it may contain some of the information that you are not allowed to share with other employees and also the employer. It is not always essential to adhere to the policies and the terms of the severance package as you may not want to follow the severance package. Reviewing the pay package is essential. If you are not able to understand the package, then you also have the chance of referring to the employment lawyer. By having the employment lawyer, you get the knack to know whom you will have to call and whom you need not call. Also the employment lawyer will help you out in tracking and advising you regarding the negotiation. Make sure you consider the offer, it is important as there are a number of aspects of the severance agreement that may affect you in many ways. For instance, your agreement may include a complete clause that hinders you from getting employment in the same field for specific period of time. In many states the on competent clauses are not worth to enforce, so check this thing with your attorney. Maybe some part of the agreement is vital for you but is someway creating discrimination, limiting your ability to perform certain task. If in case you find any of the discrepancies in the agreement, compare the agreement with the other employee. Negotiating the agreement will help you out to ask number of vital questions like asking for more money like doubling of money with added bonuses, retention of the equipment’s like any of the computers or cell phones you would like to keep back, making use of the office space for making copies of the resume or to find office space to find new employments, outplacement services and at the end recommendation that will help you in securing your new job. You may not get what you wish to like demanding for more sum of money but you should know how to trade one thing for something else. If the company is not finding any financial difficulty then you may not have to trade anything or any part of the agreement for the severance. Keep your situation in your mind because when the company let go of you, it probably is for their own benefits but there will be more consequences. You need to bring the things into consideration as not having a job may lead a problem to you, you may have children at home and it will be expensive for you to feed and give them the best. When you negotiate, maybe you become the one to suggest an alternative to give on the table. For this specific reason, you need to negotiate, as it will offer many number of suggestions that may work for you only, benefiting you at large in the end. Some employers do not like to negotiate but it does not mean you will fight for that, just be polite and need not become defensive for this particular reason. Just keep your point ahead. Also know what kind of phrases will help you out in the whole negotiation process. Being polite is the key to all what you do, as it can not only help you but other employees too in solving the issues related to the severance plan. You need to have a check on some of other allowances too like the educational allowance for the assurance. Apart from this, you can even ask for assistance for the training, retraining if you need for updating your own skills. When it comes to intellectual property, then make sure your credits are maintained properly if you know you have contributed creatively for the projects. Even if any of the royalties are due to you, then make sure they come to you. Also you will need to have a positive reference for the future job prospects. When it comes to management roles, it is critical to know how and what strategy company uses to announce your departure. It can be anything, verbal, written or any type of briefing to the company staff. Also make sure if you can buy the company car that you were making use or no, or also see if any of the taxable implications will come if the car will be in use until the lease of the car expires. Although it is very hard to think about this now but it is equally important to think and consider the payments for longer period of time. You may even wish to have continuation of the payments at your home in case you die early. Also refer to the legal expenses so as to review the package well in advance. Apart from this if you want transition to the unemployment, the request for it must be done for the period of six, three or any number of months. In case of the bankruptcy, the company must oblige the amount in risk to the shareholders. Not just in the case of bankruptcy but also in the case of selling off the assets, merger, acquisition etc. This must be negotiated by you with the company in case of reviewing the severance pay package or many rights will be taken away from you in case of the ignorance towards the severance negotiation. Even if you have worked overtime in the company and has called on almost everyday, then you should ask for the compensation for that expectation and work done too. This should also be included in the negotiation process after full scrutiny. Apart from this, if you have any other additional work done and needs to be paid, then include that too into the termination agreement before leaving the organization. 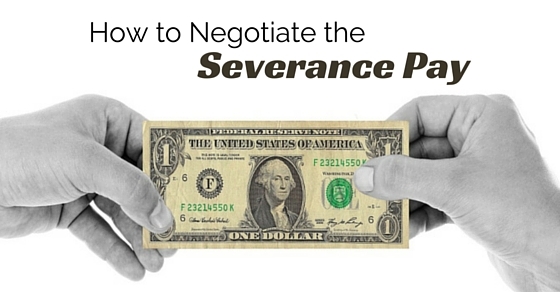 So, above are some of the ways by which one can negotiate the severance pay. Negotiating the severance pay must be done by all the employees with the employers of the company. Being terminated from the company is stressful of everything in a life but if you know how to play with the head and tail, you will be able to negotiate the best deal for yourself and also you will be able to owe on with lots of confidence.